A group of individual modules you can cherry-pick to add sophisticated functionality to your route planning software, including cluster planning, digital mapping, route optimisation, geocoding, loading space optimisation, track and trace, map matching, emissions calculation, toll calculation, traffic information, radius search, geofencing and navigation. 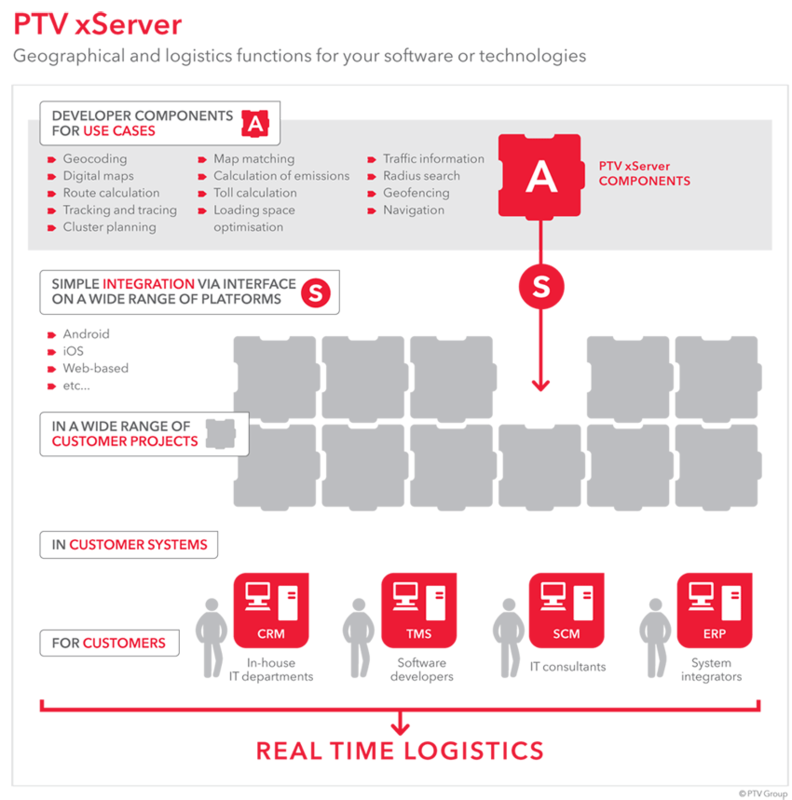 PTV xServer systems integration solutions: Integrate customer-relevant functions into your own software. Instead you can use our know-how and our long-term experience. The use of standard technologies and formats guarantees simple and reliable processing of results. All components contain an XML/SOAP/JSON standard interface. This means they can be easily integrated into your own systems and applications. Our support provides help during every phase of the project. Without delay and with you personally. The modular structure of the PTV xServer enables you to extend your software solution with more functions at any time. Thanks to cluster technology, you can expand your solutions at any time so that they always meet your performance requirements. We build on long-term customer and partner relations. Continuous further developments, new ideas and close proximity to the market guarantee products which are excellent in technology and quality. Profit from maps and data from leading providers and PTV's own data material preparation. 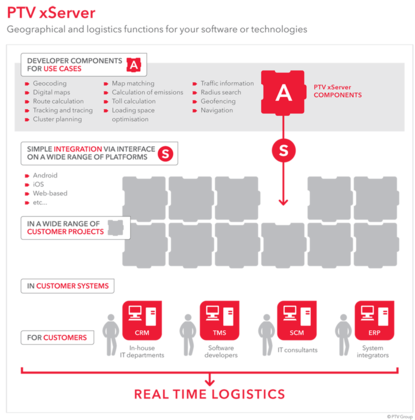 Customise the PTV solution to suit your needs: The map design, the error tolerance when geocoding and the preference for certain road classes in the route calculation are only some examples of the many options which can be set. You decide which roads are included in your route calculation and the way in which they are used. Roads and road segments can be blocked and released or permitted and banned for certain vehicle types.